(SAVANNAH, GA) In recognition of Goodwill Week, Goodwill of the Coastal Empire plans to provide ten job fairs open to the public throughout the region. As a leader in job preparation, training, and placement services, Goodwill Job Connection Centers will host job fairs beginning Tuesday, May 6 through Friday, May 9 at 10 a.m. Local residents can learn about Goodwill training resources and job opportunities within their community. Employers in attendance will share information about their organizations and offering employment opportunities to qualified job seekers. Various industries will be represented, including hospitality, retail, aerospace, and manufacturing. It is recommended that job seekers bring resumes and dress professionally. Job Seekers can learn more about Goodwill Job Connection Centers, Goodwill Job Fairs and how Goodwill can help you find a job at www.goodwillsavannah.org or call 912.354.6611 for more information. Goodwill Week was first celebrated in May 1951 as a way to encourage local Goodwill agencies to educate their communities about their mission of helping people with disabilities help themselves. Every year during the first full week of May, Goodwill agencies across the United States and Canada celebrate the power of work through local events and promotions. Goodwill of the Coastal Empire, Inc. is a 501c3 not-for-profit organization with over 850 employees. In 2013, Goodwill provided services to 19,518 people and placed 1,672 into employment. Goodwill serves 33 counties in Georgia and South Carolina, operating 19 retail locations, and ten Job Connection Centers. Goodwill accepts tax deductible donations of clothing, household items, computers, and car donations, as well as operates an online store at www.shopgoodwill.com. For more information on Goodwill of the Coastal Empire, please visit www.goodwillsavannah.org. Find us on Facebook: Savannah Goodwill or follow us on Twitter: @SavGoodwill. (SAVANNAH, GA) "Avatar® ReSurfacing® Weekend Workshop Apr 5-6th, 9am-7pm at Anahata Healing Arts Studio. Change your beliefs and change your life. Learn a skill to quickly and effectively change your beliefs and line up with your true power and potential. Call Brie 912-429-9981 for more info and to register." (SAVANNAH, GA) The Telly Awards has named Savannah’s Cosmos Mariner Productions the winner of one Silver and four Bronze awards in the 35th Annual Telly Awards. With nearly 12,000 entries from all 50 states and numerous countries, this is truly an honor. · The Silver Telly (the highest level of Telly Award) in the category TV Programs, Segments, or Promotional Pieces—Documentary, was captured by “Isaiah Davenport: Portrait of a Master Builder,” a half-hour documentary Cosmos Mariner Productions created for the Isaiah Davenport House Museum. · A Bronze Telly, in the category Non-Broadcast Productions—Education (for academic use) goes to “A Deadly Pestilence: Yellow Fever in Savannah,” another production for the Isaiah Davenport House Museum. · A Bronze Telly, in the category Internet/Online Commercial—Not-for-profit, goes to “Capt. Matthew Freeman: The Mission Continues,” a short video created for the website of the Matthew Freeman Project: Pens and Paper for Peace. · Two Bronze Tellys, in the categories TV Programs, Segments, or Promotional Pieces—Documentary and TV Programs, Segments, or Promotional Pieces—Copywriting, go to “Savannah in the Civil War,” a feature-length documentary produced in 2012. A prestigious judging panel of over 500 accomplished industry professionals evaluated entries to recognize distinction in creative work. Entries do not compete against each other – rather entries are judged against a high standard of merit. Less than 10% of entries are chosen as Winners of the Silver Telly, our highest honor. Approximately 25% of entries are chosen as Winners of the Bronze Telly. Cosmos Mariner Productions was founded in 2007 by historian and longtime Savannah journalist Michael Jordan. Over the years, the company has produced numerous historical documentaries, and has grown to provide video production services for a wide range of nonprofit and corporate clients throughout the Savannah community and beyond. You may learn more and see examples of Cosmos Mariner’s work at the company’s website, www.cosmosavannah.com. Media inquiries should be directed to Michael Jordan, President of Cosmos Mariner Productions, at (912) 713-8411 or mj@cosmosavannah.com. Since the early 1970s, I’ve been interested in healthy living. I always like to talk about a book that I read called “Sugar Blues” that really made an impact on my life and made me realize we need to do things differently. Currently, I serve as the Director of Healthy Living & Community Development at Healthy Savannah Initiative, Inc., a nonprofit organization dedicated to making Savannah a healthier place to live, in association with YMCA of Coastal Georgia, and the President & CEO of Wound Care Clinic – ESU, Inc. I also volunteer in a variety of positions in Savannah, including serving on the Savannah Chatham Food Policy Council. 1) I tell people that it all starts with making healthy choices in food and drink. There are a thousand resources out there about what is good for you and what is not and, there is conflicting data as well. You need to start by eating whole foods–foods that are fresh and local. Most of those, you want to be plants, and you want lots of green things. Greens are so important to your health. 2) Portion control is essential. We live in a city where food drives a lot of commerce. People come here to eat. We get too much food, we’re not exercising enough to burn those calories off, and the food we are eating does not always have the nutrients our bodies need. 3) Don’t try to do this alone. Whatever your family consists of, it’s important to do these things together. It starts with eating together as a family. It is really important, and good quality time being spent. It is taking the opportunity to make healthy choices as to what you are eating, but also doing it while spending quality with those you love. 4) Exercise is Vital. It is really simple: just walk for thirty minutes every day. Walking is the best exercise you can do. Find the time in your day to do it, and I encourage people to do it with their families or even your coworkers. The togetherness part of exercise is important, too. The significant improvement in that is making the healthy choices and doing it with people–being with them. 5) I believe in setting the example. When you adopt a healthy lifestyle in diet and exercise, and you’re sharing these activities with others, not only are you holding yourself accountable for your own commitment, you are encouraging health for those that you care about. Keep a smile on your face and laughter in your heart. It’s so important to be positive. If we have a smile on our face, someone else is going to smile, too. 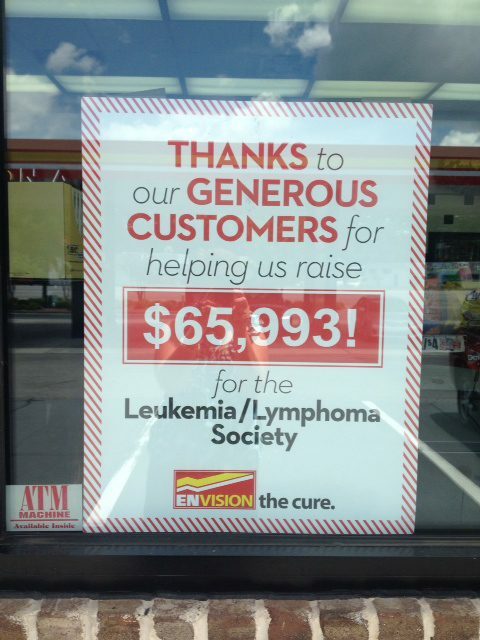 (SAVANNAH, GA) Enmark Stations, Inc. has made a commitment to once again sell paper icons in all 59 of its retail stores in Georgia, South Carolina and North Carolina in support of The Leukemia & Lymphoma Society’s Light The Night Walk. The paper icons will be sold in all stores from May 1-31. The paper icons, which can be personalized with the donor’s name, can be purchased for $1 and will be displayed on surfaces inside the Enmark stations. The company has set an aggressive goal to raise $75,000 in support of LLS’s mission to cure blood cancer and help patients and their families. This is a $10,000 increase over the $65,000 they raised in this same campaign last year. In addition to the paper icons sales, Enmark Stations will hold two Full-Service Fridays to raise funds for LLS. Full-Service Friday allows customers to pull into the Enmark Store, where members of the Enmark management team will be pumping gas for donations. Full-Service Fridays will take place from 4-6 pm on May 9 at 14000 Abercorn Expressway across from Savannah Mall and again at 3219 Skidaway Road from 4-6 pm on May 23. Enmark was recently honored with a National Partner Award from The Leukemia & Lymphoma Society (LLS) for their outstanding fundraising support in the 2013 Light The Night Walk campaign. In their first year, Enmark raised an incredible $65,648 to cure leukemia, lymphoma, Hodgkin’s disease and myeloma and to improve the quality of life of patients and their families. In Georgia, Light The Night’s fundraising efforts have grown to more than $2 million dollars at five walks across the state. Savannah’s Light The Night Walk will take place on Friday, October 17 in Forsyth Park. During the event, walkers carry an illuminated balloon along the walk route. Cancer patients and survivors will carry white balloons as “lights of hope,” supporters carry red balloons and those walking in remembrance of someone carry gold balloons. For more information, visit www.lightthenight.org/ga or call 912-436-3280. The Savannah Branch of The Leukemia & Lymphoma Society Georgia Chapter hosts five major fundraising campaigns, a volunteer-driven Leadership Committee, a Patient Services Committee and a Patient Support Group. For more information on how to get involved with Savannah LLS, visit: www.lls.org/ga/savannah or on Facebook: www.facebook.com/llssavannah . The Georgia Chapter serves patients with a variety of programs including the Patti Robinson Kaufmann First Connection Program, the Trish Greene Back to School program for children with cancer as well as financial assistance programs which last year provided over $1.45 million to patients statewide. Currently, the Georgia Chapter funds $2.75 million towards research grants in multi-year agreements with Emory Winship Cancer Institute. There were approximately 4,070 new diagnoses for blood cancer in Georgia in 2011. For more information on the Georgia chapter of LLS, please call 800-399-7312 or 404-720-7900 or visit www.lls.org/ga . Founded as Interstate Stations in 1963 by Robert Demere, Enmark Stations, Inc. is a family-run business committed to offering its customers top-notch service and superior products. Today the Savannah-based company, which will celebrate its 50-year anniversary in 2013, operates 59 stores in Georgia, South Carolina and North Carolina that offer high quality and competitively priced gasoline, food and beverages, lottery services and more. Enmark’s gasoline is filtered through a trademarked Double Filtered System, resulting in gasoline and diesel that is clean and 100-percent water-free. Enmark customers can save up to $.10 per gallon by using an Enmark Cash Card, a reloadable stored-value card that can be used directly at the pump. For more information on Enmark Stations, Inc., please call 912-236-1331 or visit www.enmarkenjoy.com . (SAVANNAH, GA) Savannah Toastmasters announces the graduation of the 2014 Savannah Speechcraft for Professional Women class. The 4-session course was developed by Toastmasters International to boost professional women’s communication skills. Participants from business, law, education, and nonprofit organizations prepared and delivered three speeches during the workshop. Seasoned Toastmaster mentors instructed participants on communicating effectively, planning and delivering speeches, and impromptu speaking. Sessions were held at The Creative Coast on York Street downtown Savannah. For information on upcoming Speechcraft courses, email savannahspeechcraft@gmail.com or visit www.facebook.com/savannahspeechcraft. The Savannah area Toastmasters clubs that co-sponsored the Speechcraft course included: Savannah Club #705, Small Business Chamber Toastmasters, and Hostess City Toastmasters. Savannah Speechcraft for Professional Women Class of March 2014 and mentors. Pictured L to R: Marjorie Young, Beth Logan, Kelly Freeman, Candis Lott, Jessica Neeley, Carla-Mae Crookendale, Terri Todd, Silvia Cartagena, Anne Cordeiro, Joanne Morton, Jennifer McFarland, Julie Warner, Lauren Bordeaux, Cynthia Wright, and Brie Pawlak. Toastmasters International is a nonprofit educational organization that teaches public speaking and leadership skills through a worldwide network of clubs. Founded in October 1924, the organization currently has more than 292,000 members in 14,300 clubs in 122 countries. The state of Georgia, District 14, is the largest district in the world. For information on Toastmasters International visitwww.toastmasters.org. Follow Toastmasters International on Twitter @Toastmasters. (SAVANNAH, GA) On April 29, Paula Kreissler will talk about ‘Five Strategies for Busy Families to Stay Healthy’ as the second of five lectures in the Enmark Encourage Health Educational Series 2014. Kreissler is President & CEO of Wound Care Clinic – ESU, Inc. in Savannah, and the Director of Healthy Living & Community Development Healthy Savannah and YMCA of Coastal Georgia. The selected charity for Kreissler’s lecture is Girls on the Run. Kreissler will discuss how to make small habitual changes to transform your health. Her lecture will cover 5 topics, including: making healthy choices in food and drink, portion control, changing together, exercise is vital, and setting the example. (BLUFFTON, S.C.) – Janet Boyden, a sales associate with Celia Dunn Sotheby’s International Realty, will be the volunteer overseeing the new Bluffton Self Help project kicking off in April. “These women each donate $100 annually and the funds support the mission of Bluffton Self Help including hosting two events that teach women how to dress, interview and secure sustainable employment,” Coleman explained. Other projects will be developed by these women such as quarterly networking opportunities to interact with other Great Women in our community. “This is an opportunity for women in Bluffton to help other women,” Coleman said. “We want to show the Heart of Bluffton.” For more information on being one of the supporters, contact Lili Coleman at Bluffton Self Help by email (lili@blufftonselfhelp ) or by calling 843-757-8000. For more than 25 years, Bluffton Self Help has been helping Bluffton area neighbors get back on their feet. Bluffton Self Help provides food, clothing and a wide variety of services such as short- term emergency financial assistance to working families in a documented crisis. Bluffton Self Help assists people in many other ways, including medical assistance and children’s programs. They also provide scholarships through the Mrs. Ida Martin Scholarship Program, named after the founder. Financial assistance for education is available to persons registered at a local college or a technical program who meet the scholarship guidelines. Boyden was astonished to learn that Bluffton Self Help has more than 125 involved volunteers, and that information confirmed she had found the right non-profit to help. “To me, it just spoke volumes about how credible they are,” Boyden said. “For an organization to be able to attract that level of volunteer commitment – it’s just amazing to me.” She never found that level of commitment when she volunteered in Atlanta. Boyden believes more people are open to volunteering once they find ways they can help. Boyden works as a sales associate in the Bluffton office of Celia Dunn Sotheby’s International Realty. She moved to Bluffton from Savannah, where she grew up as the daughter of custom homebuilder Bill Boyden. She spent much of her career in Atlanta, where she was named to the Atlanta Board of Realtors Multi-Million Dollar Sales Club for five consecutive years. She also worked for more than 12 years as a consultant for various Fortune 400 and 500 companies, developing strategic partnerships with top executives throughout the country. Boyden has dedicated time outside of work serving as a volunteer for her church, Compassion International and the Hope4Guatemala Mission. For more information on Bluffton Self Help, visit www.blufftonselfhelp.org . (SAVANNAH, GA) MaschioPack North America LLC has launched as a wholly owned subsidiary of Colonial Group, Inc., exclusively licensed by MaschioPack GmbH, to manufacture and sell Composite Intermediate Bulk Containers (IBC’s) throughout North America. Colonial Group, Inc. ranks #59 on Forbes list of America’s Largest Private Companies, and its newest venture is expected to create over fifty jobs, quite possibly in its home state of Georgia. MaschioPack North America will start production in the 4th quarter of 2014, and their first plant will be located in the Southeastern United States, producing both 275 and 330 gallon IBC’s. Pete Brunn, who started in the industrial packaging industry in 1972, will lead MaschioPack North America as its Vice President and General Manager. Mr. Maschio first began producing industrial packaging in 1972. He now has manufacturing plants in Germany, France, Spain, and Italy, and his product mix includes IBC’s, Drums and Jerry Cans. Always an engineer at heart, Mr. Maschio also designs proprietary manufacturing equipment and systems for blow molding and plastic applications. These complementary capabilities give MaschioPack unmatched efficiencies in producing high quality, innovative and cost effective industrial packaging. Sales & Marketing Director Europe. MaschioPack GmbH produces 1000 liter Intermediate Bulk container (IBC) and 220 liter drums and smaller jerrycans (5 – 30L) made of high density polyethylene. MaschioPack GmbH has the experience and a knowledge of more than 35 years. This experience makes it possible to produce a range of high-quality packings for different sectors of industry such as chemistry or food for example. The name Maschio stands for quality, experience, flexibility, development and primarily for success. For more information on MaschioPack and its European subsidiaries please call 0049 2431 948 480 or visit www.maschiopack.de . A third generation family company founded in 1921, Colonial Group, Inc. (“Colonial Group”) is a diversified energy and port-related company, ranking #59 on Forbes List of America’s Largest Private companies with over 900 employees. Its history is rooted in the marketing, retailing, and distribution of petroleum products for the transportation, industrial, and marine applications. Over the years, its offerings have grown to include natural gas storage and marketing, liquid and dry bulk terminaling, retail fuel & ENMARK convenience stores, industrial chemical supply & distribution, and marine vessel safety and compliance consulting. For more information on Colonial Group, Inc., please call 912-236-1331 or visit www.colonialgroupinc.com . (SAVANNAH, GA) The Rotary Club of Savannah announces ten recipients have been selected for the Century Service Award, given in honor of the club’s 100th Anniversary. The Century Service Award, comprised of ten $1,000 grants, is designed to provide funds for business enhancements. The selection committee received and reviewed 46 grant applications, and selected ten projects that aligned with the Rotary motto, “Service above Self”, and the 4-way test. The Century Service Award recipients include: Bethesda Academy to create a Spanish program; Chatham-Savannah Citizen Advocacy for new technology; Georgia Historical Society for video and software equipment to support the GHS School Tube site; Georgia Legal Services for new technology; Historic Savannah Foundation to supply the Hands on History program; Live Oak Public Libraries to build a Resume Completion Station; National Museum of the Mighty 8th Air Force to reprint books and update display cases; Savannah Speech and Hearing for new technology; Savannah Tree Foundation for new wheel barrows; and Telfair Museum of Art to install audio-visual overflow PA system in the Jepson Center Auditorium. Projects will be fully funded with this grant.